The antibody is a mouse monoclonal antibody against recombinant Human Ep-CAM. Human. Does not react with mouse. Not yet tested in other species. The Ep-CAM antigen (Epithelial Cell Adhesion Molecule), also termed as MK-1, GA733–2, KSA, 17–1A or EGP40, is a 40 kDa type-I transmembrane glycoprotein with properties of Ca2+ -independent homotypic intracellular adhesion molecule. The full leghth of the molecule is 314 amino acids. Structurally, Ep-CAM is not related to any of the major families of adhesion molecules. The Ep-CAM antigen is overexpessed on the majority of tumor cells of most human epithelia of variety of tumor tissues such as stomach, colon, pancreas, gall bladder, bile duct, mammary gland, breast and lung carcinoma. 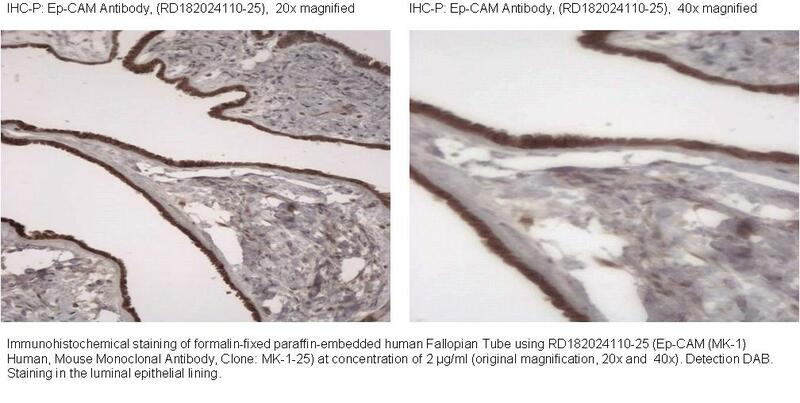 Ep-CAM has been suggested to be involved in the differentiation and growth of epithelial cells under normal physiological conditions through its homotypic cell-cell adhesion activity. As it is overexpressed on most carcinomas, Ep-CAM antigen has been used as a target for diagnosis and therapy of cancer.